Conservative author Dinish D'Souza will take the stage Jan. 23 at Indiana State University's Tilson Auditorium in conjunction with the University Speakers Series to discuss "Islam vs. the West: A Clash of Civilizations." His presentation, which begins at 7 p.m., is being co-sponsored by the College of Arts and Sciences and WFIU. A former policy analyst in the Reagan White House as well as a distinguished writer and scholar, D'Souza also served as John M. Olin Fellow at the American Enterprise Institute, and the Robert and Karen Rishwain Fellow at the Hoover Institution at Stanford University. Called one of the "top young public-policy makers in the country" by Investor's Business Daily, D'Souza quickly became known as a major influencer on public policy through his writings. His first book,"Illiberal Education (1991)", publicized the phenomenon of political correctness in America's colleges and universities and became a New York Times bestseller for 15 weeks. It has been listed as one of the most influential books of the 1990s. His 1997 book, "Ronald Reagan: How an Ordinary Man Became an Extraordinary Leader," was the first book to make the case for Reagan's intellectual and political importance. "The Virtue of Prosperity: Finding Values in an Age of Techno Affluence (2000)" explored the social and moral implications of wealth. 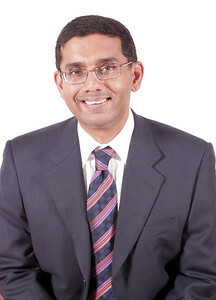 In 2002, D'Souza published his New York Times bestseller "What's So Great About America," which was critically acclaimed for its thoughtful patriotism. His 2003 book "Letters to a Young Conservative" has become a handbook for a new generation of young conservatives inspired by his style and ideas. "The Enemy at Home," published in 2006, stirred up a furious debate both on the left and the right. It became a national bestseller and was published in paperback in 2008, with a new afterword by the author responding to his critics. In recent years D"Souza has been an equally brilliant and forceful defender of Christianity. "What's So Great About Christianity" not only intelligently explained the core doctrines of the Christian faith, it also explained how the freedom and prosperity associated with Western Civilization rest upon the foundation of biblical Christianity. "Life After Death: The Evidence" shows why the atheist critique of immortality is irrational and draws the striking conclusion that it is reasonable to believe in life after death. His newest book, "Godforsaken," tackles the difficult topic of God, suffering and evil. A reception and book signing will follow D'Souza's presentation in Heritage Lounge. The program is free and open to the public. Conservative author Dinish D'Souza will take the stage Jan. 23 at Indiana State University's Tilson Auditorium in conjunction with the University Speakers Series to discuss "Islam vs. the West: A Clash of Civilizations."